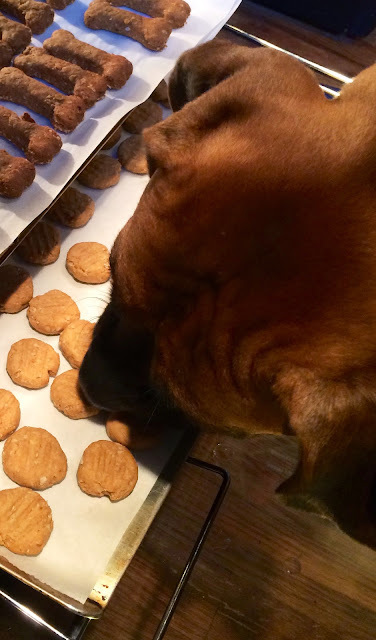 Looking for a never-fail, so-good-for-puppy, SUPER-EASY treat recipe? Well, here is one so simple, you probably have all the ingredients already at home! Plus, just think of all the additives you're leaving out of your dogs diet! Who wants that! As a bonus, this recipe is pretty basic -- you can doctor it up with whatever your doggie loves. Pumpkin is easily substituted for the Peanut Butter. Go ahead and swap some coconut flour for the wheat. Add in unsweetened coconut for a really yummy treat. Don't think too much. Just dump everything into the blender and start mixing away! You'll know the dough is the right consistency when it is play-doh like. Pretty stiff and not sticky at all. 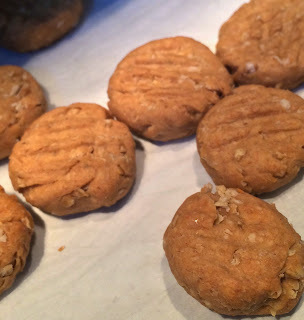 I like to roll these into balls and flatten the top with a fork - just like Mommy's favorite Peanut Butter cookies! Peanut Butter Cookies for (Wo)Man's Best Friend! Bake for 45 minutes. Then turn off oven and let sit for a few hours (or move to a dehydrator). If cookies still seem soft after an hour or two, go ahead and turn the oven back on to 350 bake for 10 minutes, then shut off. Don't open the oven and let them cool. Oh! And watch out for thieves! 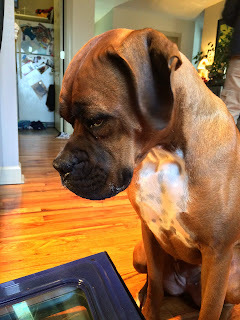 Love this new (to me anyway)blog Kathie!